Ghana international and Black Stars captain Asamoah Gyan will be launching a clothing line later in the month of November. The Shanghai SIPG player will have his BJ3 brand of products hit shops in Ghana before extending to the United Arab Emirates and current club country China. The products which will by manufactured by Puma will then be made accessible to fans in Europe and America. The former English Premier League player will be joined by officials from Puma for the launch of the BJ3 products, a brand name derived from Gyan’s ‘Baby Jet’ nickname and his favourite number 3 jersey number. The products will cut across all age groups and status and will also feature both executive and casual wears. “We are doing something creative. “It will definitely be close to home in terms of the taste and style and all that but we are also very much accommodative of other superior ideas. Asamoah Gyan arrived in Accra on Tuesday after the Chinese Super League ended over the weekend. 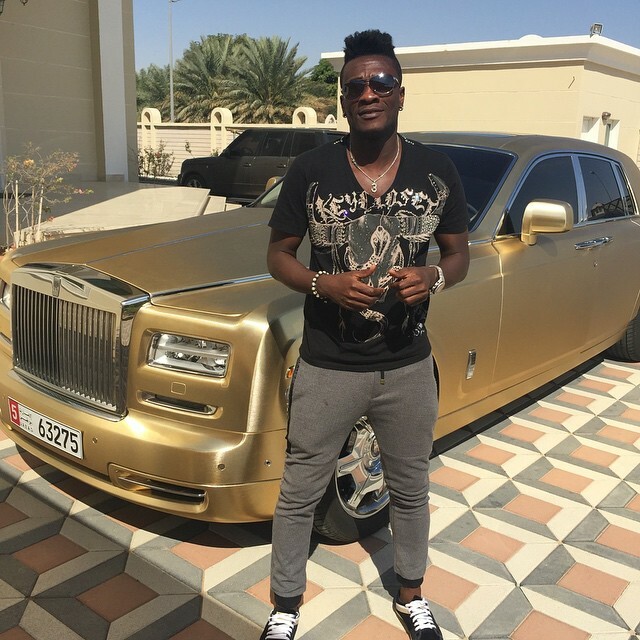 The player was spotted in his gold Rolls Royce bought during his time in the United Arab Emirates with club Al Ain.